From the inception of MLG, DiGiovanni knew that the tournaments needed to be seen by the public, and part of that is getting audiences interested in the personalities of competitive gamers. DiGiovanni compares the strength of those personalities with a similar sport: "Look at NASCAR. It's not just about cars going around in circles; there are guys in those cars. The cars are in theory very similar, but the guys, not the logos on the cars ... are what people root for." Right now, the most prominent gamers in MLG are the kids who have grown up with the sport. I spoke with Kyle "Elamite Warrior" Elam from Instinct before the tournament began and I was surprised at how grounded he was, while still passionate about winning. "I'm the captain of Instinct and probably what I'm best known for is a support objective-based role," Elamite says as we overlooked the MLG floor. "What we're really well known for is our teamwork. We have a really good team-shot, with everyone focusing on killing one person. I've got a bunch of young guys on my team. I've been playing for five years, while most of them only have 2 or 3 years of experience. I keep everyone focused, make sure that there's no bickering going on and that everyone is focused on winning the game." 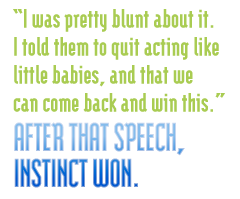 Even though Instinct had won the previous two events in this 2010 MLG season, the momentum favored the underdog, Final Boss. Cameron "Victory X" Thorlakson is the captain of Final Boss, a team which had lots of success back in the Halo 2 era of MLG but hadn't won in a long time. In fact, Victory X has never won a tournament since he started competing in 2005. In Raleigh, he was looking to change that. "In Columbus, the last event, we lost to Instinct 6 to 4 in the Finals. We're looking to avenge that," Victory X says while preparing for the tournament to begin. Even though MLG has rules in place for civility between players, Victory X is not above getting into opposing player's heads, something that athletes at nearly every level excel at. "Some people are a little more head-casey than others so you can definitely get in their heads and make them play a little worse," he says with a shrug. Victory X is the captain of Final Boss, but he says that role isn't important to him. That doesn't mean that he isn't above whipping his team into action when they start playing poorly. Early on in the last tournament in Columbus, Final Boss lost a game to a team that Victory X thought they should have beat. "I was pretty blunt about it. I told them to quit acting like little babies, and that we can come back and win this." After that speech, Final Boss won.